Anna has always had a passion for animals for as long as she can remember and you’ll find her helping you out in reception or assisting with the animals in our care. 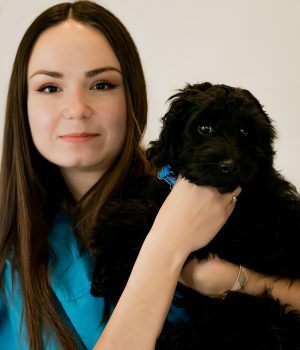 Although she started in a smaller veterinary practice, the majority of her experience comes from an emergency animal hospital which she now brings to Kleinburg Animal Hospital. Anna obtained her Honours Bachelor of Science degree in Biology from York University in 2016 and is currently pursuing Master’s degree in molecular biology. She has a little miniature pinscher whom she loves dearly. In her spare time Anna enjoys spending time at the cottage with her family and friends, reading and traveling.